Glenn Beck, is he a waste of skin, a dirt bag, lawbreaker, scumbag and a prostitute? No of course not, silly me, he calls other people that and more and he eats with that dirty mouth. "Beck is famous for spouting controversial and inflammatory comments against Democrats, Muslims, Arabs, Mexicans, and female guests on his radio and television programs. Beck has called President Jimmy Carter a "waste of skin," Mexican immigrants "dirt bags" and "lawbreakers," Katrina victims "scumbags," Cindy Sheehan a "prostitute," and suggested using nuclear weapons against parts of the Middle East and Venezuela." There was a time when the American journalistic profession was a place for true professionals and were seen as people that could be trusted to tell the truth to the American public. There were greats such as Peter Jennings, Edward R. Murrow, Ed Bradley, Mike Wallace and Walter Cronkite. Their inheritors are such men as Bill Moyer, Anderson Cooper, Charlie Rose and they do their predecessors honor. But no one can cast the buffoons of Fox News, the Rush Limbaughs' and the Glenn Becks' in the same mold, they dishonor their profession. Giants once walked among us and today lesser men and women of Fox News try to fit into shoes that are just too big. Today in America there is a new test for candidates for president and it is how much does he love the baby Jesus. Is he a god fearing, gun supporting, gay hating, get all the illegals out of America at any cost Christian. The evangelical right has set the agenda and if you are not a card carrying saved Christian you are not presidential material. It seems that the candidates all have to pander to this group as evident of the debate between Obama and McCain at the Saddleback Church. 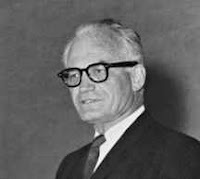 The candidates should read the words of a great American, Sen. Barry Goldwater on the separation of church and state. "On religious issues there can be little or no compromise. There is no position on which people are so immovable as their religious beliefs. There is no more powerful ally one can claim in a debate than Jesus Christ, or God, or Allah, or whatever one calls this supreme being. But like any powerful weapon, the use of God's name on one's behalf should be used sparingly. The religious factions that are growing throughout our land are not using their religious clout with wisdom. They are trying to force government leaders into following their position 100 percent. If you disagree with these religious groups on a particular moral issue, they complain, they threaten you with a loss of money or votes or both. I'm frankly sick and tired of the political preachers across this country telling me as a citizen that if I want to be a moral person, I must believe in 'A,' 'B,' 'C' and 'D.' Just who do they think they are? And from where do they presume to claim the right to dictate their moral beliefs to me? And I am even more angry as a legislator who must endure the threats of every religious group who thinks it has some God-granted right to control my vote on every roll call in the Senate. I am warning them today: I will fight them every step of the way if they try to dictate their moral convictions to all Americans in the name of 'conservatism.'" ...The economy is in a downward spiral, the national debt is at an all-time high, the dollar is an international disgrace and inflation in July had the steepest rise in 27 years, driven by oil prices fivefold higher than when George W. Bush invaded the nation with the world's second-largest petroleum reserves. 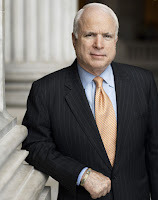 "The lesson McCain should have learned is that the world is a complex place, that today's enemies may be tomorrow's negotiating partners -- as Obama has at times dared to suggest -- and that the neoconservative idea of a Pax Americana is a dangerous fantasy. And a costly one at that, not only in lost lives and blowback from the regions we destabilize, but also in the dollars that American taxpayers must waste. Andrew Bacevich cannot be the darling of the right because he commits the most grievous sin of them all, he tells the truth. 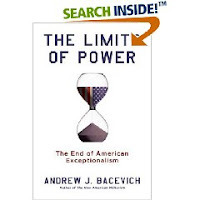 "In this caustic critique of the growing American penchant for empire and sense of entitlement, Bacevich (The New American Militarism) examines the citizenry's complicity in the current economic, political, and military crisis. A retired army colonel, the author efficiently pillories the recent performance of the armed forces, decrying it as an expression of domestic dysfunction, with leaders and misguided strategies ushering the nation into a global war of no exits and no deadlines. Arguing that the tendency to blame solely the military or the Bush administration is as illogical as blaming Herbert Hoover for the Great Depression, Bacevich demonstrates how the civilian population is ultimately culpable; in citizens' appetite for unfettered access to resources, they have tacitly condoned the change of military service from a civic function into an economic enterprise. Crisp prose, sweeping historical analysis and searing observations on the roots of American decadence elevate this book from mere scolding to an urgent call for rational thinking and measured action, for citizens to wise up and put their house in order. " Last August, John McCain's campaign was a guttering candle, out of money but flush with half-baked ideas that were unlikely to be improved by further baking. Anyway, to have many ideas is to have too many for a campaign's concluding sprint, and McCain's revival has not been robust enough to bring him even with Barack Obama. Now McCain's rejuvenated hopes rest on his ability to recast this election, focusing it on who should lead America in a world suddenly darkened by Russia's war of European conquest. "Jeremy Jackson, director of the Scripps Center for Marine Biodiversity and Conservation at the University of California, San Diego, synthesizes such reports and others into a new paper, published in the journal Proceedings of the National Academy of Sciences, that boldly lays out the scope of the oceanic emergency and what urgently needs to be done. "The purpose of... the paper is to make clear just how dire the situation is and how rapidly things are getting worse," said Jackson. "It's a lot like the issue of climate change that we had ignored for so long. If anything, the situation in the oceans could be worse because we are so close to the precipice in many ways". 19, of Mashpee, Mass. ; assigned to 3rd Battalion, 6th Marine Regiment, 2nd Marine Division, II Marine Expeditionary Force, Camp Lejeune, N.C.; died Aug. 14 while supporting combat operations in Anbar province, Iraq. 23, of Naperville, Ill.; assigned to the 978th Military Police Company, Fort Bliss, Texas; died Aug. 13 in Baghdad of wounds suffered when his vehicle encountered an improvised explosive device. 23, of Daingerfield, Texas; assigned to the 6th Squadron, 4th Cavalry, 3rd Brigade Combat Team, 1st Infantry Division, Fort Hood, Texas; died Aug. 10 at Forward Operating Base Bostick, Afghanistan, from injuries sustained in a non-combat related incident. 22, of Maryville, Tenn.; assigned to the 3rd Reconnaissance Battalion, 3rd Marine Division, III Marine Expeditionary Force, Okinawa, Japan; died Aug. 10 while supporting combat operations in Salah ad Din province, Iraq. 25, of Christiansburg, Va.; assigned to the 1st Battalion, 14th Infantry Regiment, 2nd Brigade Combat Team, 25th Infantry Division, Schofield Barracks, Hawaii; died of wounds sustained Aug. 10 in Tarmiyah, Iraq, when an improvised explosive device detonated near his position during dismounted operations. 23, of New York; assigned to the 515th Transportation Company, 28th Transportation Battalion, Mannheim, Germany; died Aug. 9 in Sadr City, Iraq, of wounds sustained when his vehicle encountered an improvised explosive device Aug. 8 in Sadr City.